As skydivers, we passionately talk about the sport we love and wish everyone would try it at least once because the experience exceeds what you may be expecting. Most people elect not to try it because they’re scared of jumping from “a perfectly good airplane.” The concept of it just doesn’t make sense. 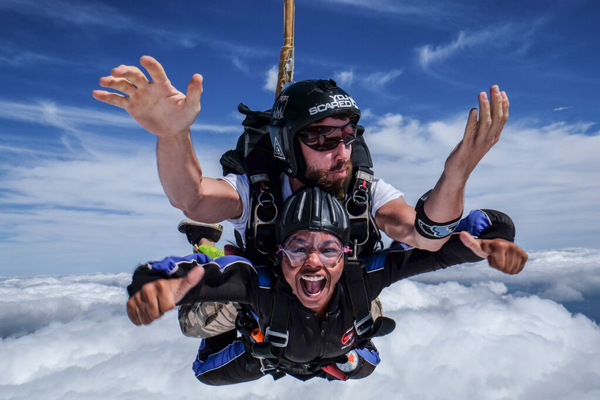 Before you decide that skydiving isn’t for you, we want to answer a very common question… Is skydiving scary? Ready for the truth? The answer is yes and no. Conceptually, jumping from an airplane two+ miles above earth is absolutely scary. Our inner fight or flight mechanism trains us to respond to certain dangers. Moving towards the open door of an aircraft is scary, no question about it and our brains are usually nudging us towards the flight sensation (as in not flying without the plane). Truthfully, the majority of skydivers who have thousands of skydives under their belt still feel a big spike in their heart rate as they move towards the door. It’s natural and kind of scary. The reality is that as soon as you leave the airplane, you’re no longer scared. It’s completely ironic. In fact, skydiving might be considered by some as a kind of therapy. Look at the photos of many of our first time jumpers and you’ll see some very nervous faces on the ride to altitude, but complete delight in free fall. It happens every time. Why don’t people look scared during the skydive? The answer actually lies in physics. Within seconds of leaving the airplane, you enter a state known as terminal velocity. Terminal velocity itself sounds scary, but it’s an awesome feeling because you don’t feel like you’re falling. You’re essentially riding on air molecules that remove that plummeting feeling that one would feel when bungee jumping. Terminal velocity allows for the complete enjoyment of the experience because you feel in control as opposed to wildly falling to earth. Now that you know skydiving isn’t TOO scary, we encourage you to check out 7 questions everyone should ask before booking a tandem skydive! Already know you’re ready? Get rates and info for first time tandem skydiving. All photos courtesy of Cristobal.